The holiday season would not be complete without fun holiday parties. Part of what makes holiday parties fun is dressing up in fancy and festive dresses. When it comes to picking party dresses, I almost always seem to go for the classic A-line style. I love this style because it is flattering on most body types. This pretty white Maison Jules dress is a perfect A-line holiday dress. 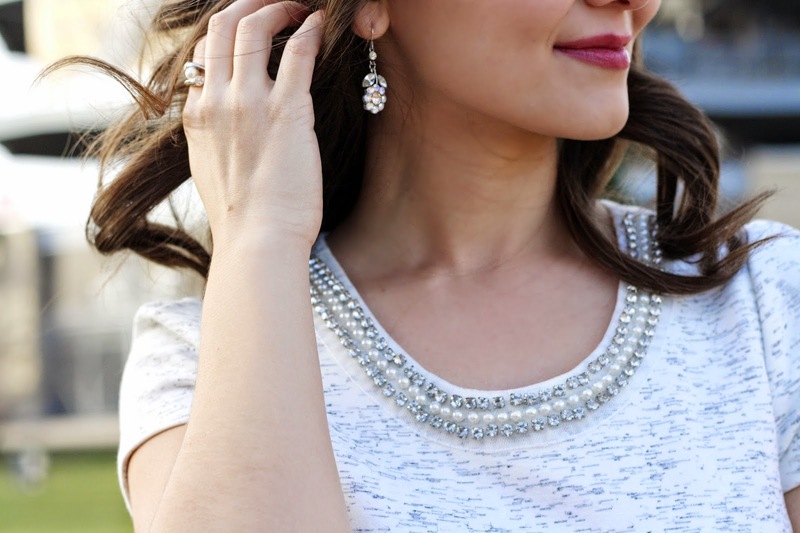 It has an embellished neckline which is always a plus because it acts as a necklace, and who would say no to a pretty necklace for a holiday party? Paired with red tights, the dress looks even more fun and feminine. Bow pumps complete the look by adding the perfect holiday touch. What do you think about this holiday party look? Also, Christmas is only 10 days away, if you are still stuck on what to get your loved ones, check out my holiday gift guides: under $100, under $50, under $25, for him. Fantastic look, girl. Love the dress, it's so pretty. Those red tights are so unexpected but so fun! I love the embellished neck of your dress! So pretty! Such a great dress- loving how you wore it here!